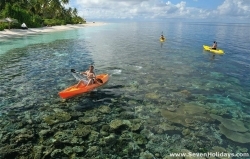 Tiny circular island with superb all-round beach and a reef that attracts snorkellers from far and wide. Boats stop by offering half or full day mini-cruises. Friendly and respectable, Velidhu’s popularity is partly explained by the committed staff, sociable evenings, terrific food and proximity to world-class dive sites.